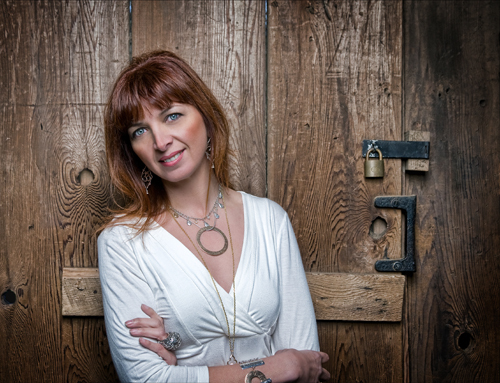 When we meet at a little Japanese tea house in Vancouver, I recognize Canadian artist, sculptor, designer and Yogini Sonja Picard by her striking auburn hair. It’s an apt complement to her infectious smile and vivacity, yet belies the layer of serenity that lies just beneath. Having enjoyed an active career as an artist and sculptor, Sonja began a study of yogic philosophy in 1996, and was inspired to create and design pieces of jewelry as an homage to this knowledge. In 2000, she launched her eponymous jewelry line, the Sonja Picard Collection (SPC) that now has over 350 pieces crafted in silver, gold, gemstones and Canadian diamonds and celebrates the yogic and tantric traditions of adornment. Today, Sonja puts her sculptural background to use as she first hand-carves each original piece in wax, adding a unique, sculptural organic and tactile quality to her jewelry. 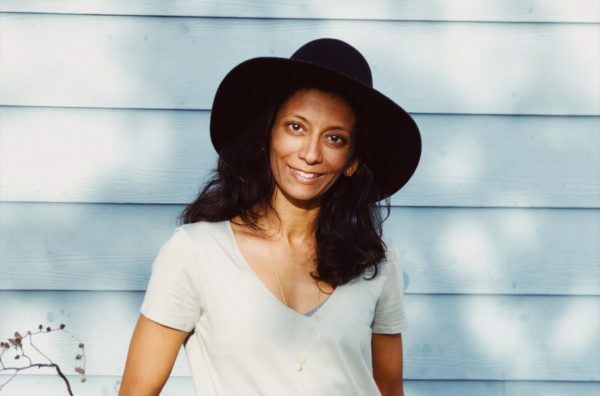 As Sonja launches the newest addition to her work, the SPC Bridal Collection, Yogue chats with her about Yoga, creativity, the eco aspects of her design process and of course bridal inspired yogic jewelry. Also, read on to get a special offer on SPC jewelry just for Yogue Readers. SP. The bridal line was created by several insights: First – there were not any bridal collections within the market that had any ‘divine’ meaning or inscriptions, mantra’s on or inside the ring, unless you commissioned an artist/ jewelry designer to specifically make you a ring. A wedding/commitment ring is such a sacred step between two people, along with the rings being a symbol and meaning of their commitment to one another. I felt there was very little being created to reflect that sentiment. Most people are left to choose from the traditional rings within the market place, not to mention that men’s rings were very, very plain and understated. 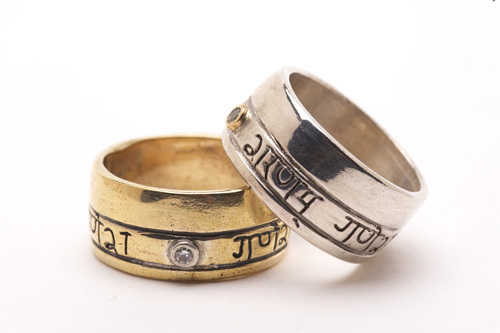 Secondly, the inspiration came from people using our Lord and Goddess stack ring series for wedding rings and I thought ‘hey it’s time to create a full line of commitment rings using mantras’ such as Ganesha Sharanam a mantra chanted to bless new beginnings. 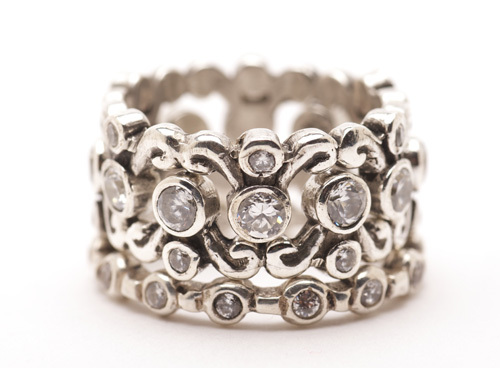 We also utilize Canadian ethically mined, beautiful diamonds. All the rings are created in yellow, rose, white or green 14K gold. Most of our line has brides and even the groom using several rings to create a unique expression of their relationship together. 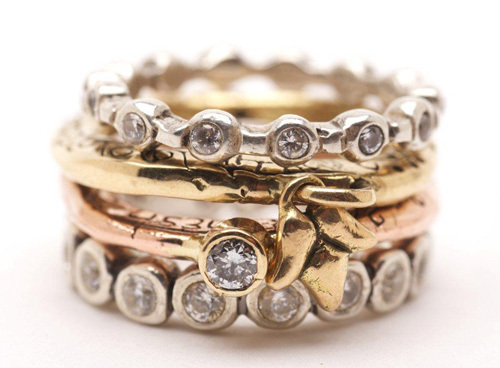 Like stacking an eternity band with ganesha sharanam and then another stack that says love is inconceivably, simultaneously one and different – a translation from the Vedic mantra Achintya Bhedaabheda tattva. 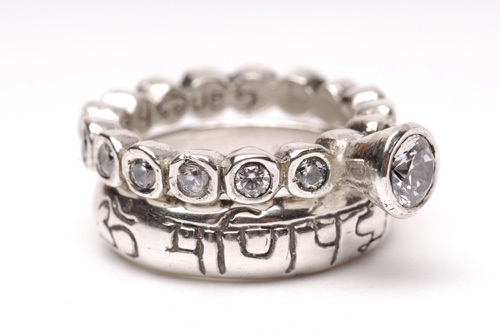 You can throw in a tiny eternity band with Om inscribed inside… Men and women also love Om mani padme hum – may the jewel of your love shine in your heart. You can match that with an eternity band for the bride. Y. 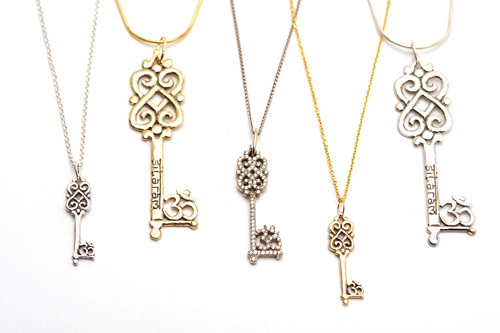 What inspires your Jewelry design process? I am really inspired by the ancient knowledge and philosophy of yoga – the beautiful meanings, symbols, mantra’s and their sound vibrations is a kaleidoscope of ideas and inspiration that will never be fulfilled for me in ‘this lifetime’! When I first encountered the philosophy of yoga through my guru Jeffrey Armstrong 14 years ago I started to incorporate a morning sadana using the mantras’ which sets a beautiful intention for the day – then I thought how can I remember these mantra’s? Jewelry!!! … I could have a reminder of its beauty, meaning and intention with and on me all day – like a positive affirmation. I also love and am inspired by the ancient traditions of Indian adornment and its various meanings of shringar – there are 16 points of adornment for women…. how can you not be inspired to dress up for your loved one – its a great opportunity to express your ‘shakti’ ! Y. What is your Yoga practice and how does it affect/ impact your work? SP. My yoga practice is all ‘bhakti’ a morning sadhana and chanting – yes some times i do asana yoga – If it’s a day when I am carving and creating a piece in the studio I will do my sadhana (chanting) internally while I create the piece – so my yoga practice can take me all day. My inspiration primarily comes directly from attending weekly satsang with my teacher and allowing the knowledge to ‘download’ and as time time goes by, an idea or vision will come to mind and then I sketch it out – that’s where the start of a piece is created. As a sculptor for many years, my process for creating these pieces is by carving a piece of wax – this tactile process for me is the invoking of the human element versus a machine creating the piece – which for me I find rigid and lacking movement. I am also inspired by my surroundings or travel – for me being aware of the nuances of shapes, color, nature, is daily yoga practice. Recently I was in India for the first time everywhere I went there were puja’s for the Goddess Kali … well, this Fall there will be several pieces honouring this goddess of transformation. SP. Lessons from yoga? – that’s a big question – it literally has changed my entire life without question. To summarize it shortly it guides me in a thought process of ‘discernment’ constantly in reference to Ahimsa – non-injury to the planet, relationships, etc… and that karma is at play constantly and we have free will to use wisely with our discernment. Devi Mani Ring by SPC. Y – How do Yoga + creativity connect in your experience? Any insights? S.P. The process of creativity is unexplainable – I feel as an artist a little possessed at times… I am so compelled to stop the world in its tracks and draw a piece that is speaking so loudly to me. Right now I am creating a body of work for the Fall and a lot of pieces are being created at the same time with tons of pieces of paper everywhere – they float in the back of my head until their completion and then I can’t even think straight at times and need to go to my drawings and work out the idea immediately. I’m always aware of this force. I play with, it’s powerful – it is a relationship that is familiar yet foreign – like a crazy lover – it’s a grand experience and still to this day surprises me sweetly. I feel very blessed to create and express myself as a woman. Y. Where can we find Sonja Picard? S.P. Please visit our website (www.sonjapicard.com) to see all the locations available nearest to you – My studio is located in Ladner and we are happy to take appointments for consults, bridal or to come see the entire collection of 400 pieces. We sell online and ship anywhere on this beautiful planet! Lastly, exclusive to Yogue readers, shop online at sonjapicard.com and receive a 20% discount until July 8, 2010. Your discount code: yogue108. Prices for the bridal collection begin from $450 and up. LOVE this! Her bobbles are heavily featured in the “LOVE & MARRIAGE” section of my Vision Board! Such a unique style! Very pretty!